Almost wordless: Hunger or insomnia lured this young possum to my compost pile on a sunny day. This little guy has not yet learned he is supposed to sleep during the day and to play dead when someone approaches him with a camera. He’s been here several times in the past week. Hope he’s just confused and not sick. I’ve been keeping an eye on him. He seems pretty perky and also young, but if he begins to look lethargic I’ll get the wildlife rehabbers out here. Possums have way too many teeth for me to attempt a rescue. 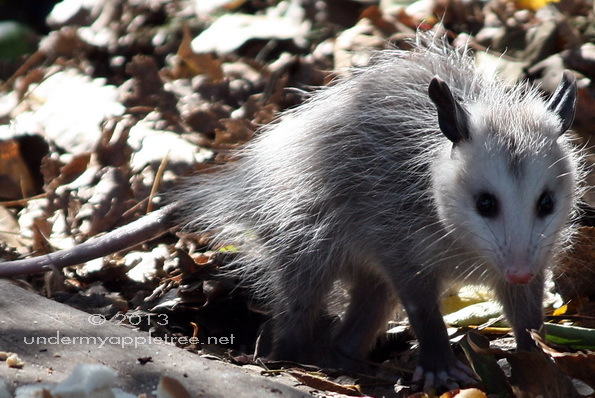 I’ve never seen a possum during the day. He’s cute in a picture, but I’m sure he would freak me out in person! Aw, maybe the weather has confused him! You have expertly caught his furtive pose. Terrific photo!